Since starting the 10-Pound Challenge this month I've really tried to focus on making conscious choices about my food. I tend to run around my day popping whatever's within reach into my mouth without thinking twice about it. Thanks wholly to my genetics, my weight and size hasn't fluctuated much throughout the years, so I figured I didn't NEED to think much about it. It's really a lot like money – just because you're THIN, that doesn't necessarily mean you're HEALTHY. With finances, just because you make ok money or don't have lots of debt doesn't mean you're making great financial choices. By not making conscious healthy decisions in my life, I'm ultimately cutting myself short and will lose out on the benefits that being healthy brings – youthfulness, confidence, long life, energy, passing good habits down to my posterity, and overall happiness. 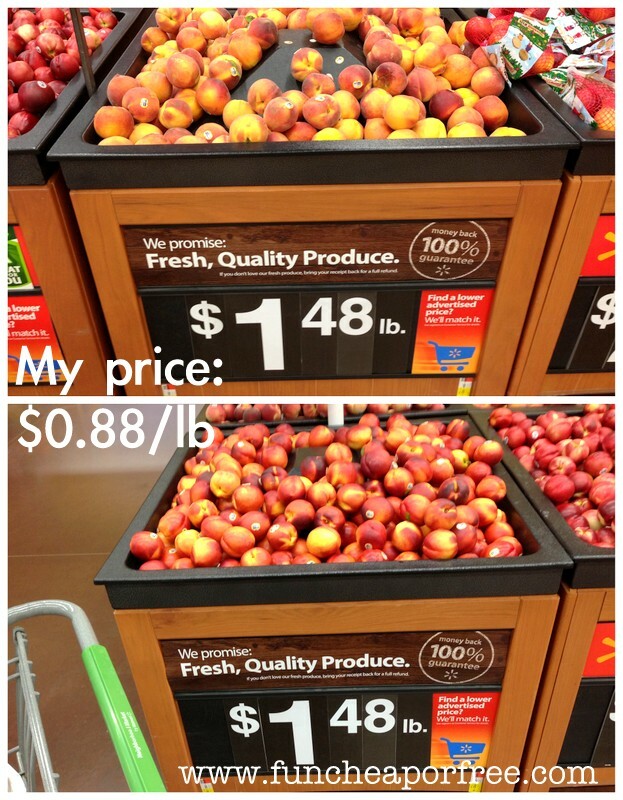 Interestingly enough…it's the same with frugality!! You shouldn't be frugal only when you're tight on cash, and you shouldn't make healthy choices in life only when you need to lose weight. It's about an overall, balanced lifestyle! With weight, it's learning to live with food and balance eating well with enjoying what you love, and finding time for regular, moderate exercise. With finances, it's learning to stretch every dollar you have so you can buy what you want and need in a strategic, balanced way. Did anyone else have an aha moment here? Health: Don't put anything at arms length in your mouth without reading the nutrition label. Frugality: Don't toss anything within reach into your cart without looking at the price tag. I have mentioned to you all many times about how I grocery shop without coupons and still save nearly half on my groceries each month. Here is a perfect example of how I was able to make conscious decisions with health AND with finances…at the same time! I spent 5-7 minutes before I left on Deals to Meals‘ site, quickly scanning through this week's deals at my local grocery stores, and adding the items I wanted to add to my grocery list for the week (don't worry, they flag the week's best deals in red for you). I printed out my shopping list (through the feature on their website) and headed to my nearest Neighborhood Walmart (the Super Walmarts are harder to price-match at). I spent about 1 hour shopping (granted, it takes me longer because I'm snapping pictures, and making tons of notes on my paper for posts like this…but I'm pretty seasoned at this point and you might be slower starting out, so I guess it all balances out in the end). And remember, you can freeze this and use it in recipes. You can even substitute thawed cottage cheese for ricotta in recipes – it's much cheaper! I normally try to avoid frozen “meals” because they are typically much more expensive than home-made. BUT…when I have days like THIS and need a quick meal that won't break my calorie bank, these are nice to have on-hand. 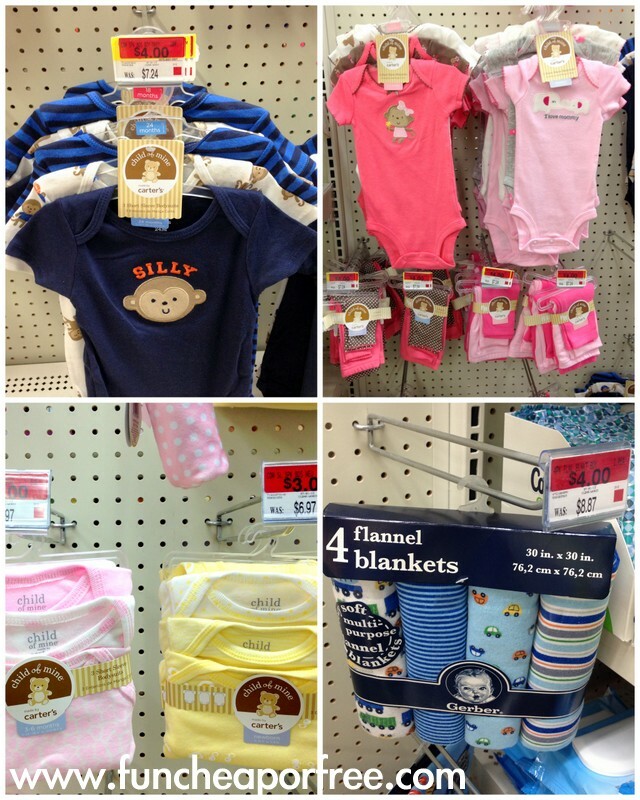 Along with good food deals, I scored some great clearance baby gear. I keep it on-hand in my “gift closet” for quick gifts for people. Remember, it's about the VALUE of a gift, and not the PRICE of a gift. So these blankets will only cost you $4, but their VALUE is almost $9! The $3 onesies? Worth $7! In this case you can take the money you save and put it toward debt, your slush fund, something else you need, or can use it toward even more gifts for that special person. It was over $111 worth of groceries, for just $76.59! Well under my $125 grocery budget. Moral of the story? You CAN buy healthy groceries on a budget. It just takes some conscious, calculated choices and a little effort. BUT…the best things in life take a little extra time sometimes, don't you think? When it comes to organic food, that's a tough one; America hasn't quite figured out how to make organic food affordable for folks. Costco is offering more and more choices. But ultimately, you need to pick and choose. Have you heard of the dirty dozen? Maybe don't do EVERYTHING organic; just pick your top choices. Also, keep in mind that just because something is generic vs. store brand, it doesn't make it less healthy (as discussed HERE). In terms of eating gluten-free? Ugh. Good luck. Once again, it's SUPER expensive. Just try to only buy gluten-free for those in your family who absolutely need it (rather than ALL of you switching over), and once again, Costco is offering more and more options which would be cheaper than the specialty stores. But ultimately, read the labels, do your research. Don’t forget about our LIVE Q&A MONDAY NIGHT!!!!! Nice haul! I have had trouble getting great value items through price matching store brands. I found this on the ad matching policy exclusions on their site: "Competitors' private label price promotions"
I have a question about price matching brands. For example, you got the Great Value brand tuna which (if I'm not mistaken) is a Wal-Mart brand. So I'm assuming the price match is for another brand since Great Value isn't sold in other stores. But I read the policy and it said that the item must be identical and among the criteria (weight, flavor, etc) they include brand. How does that work? Thanks for this info. I've heard about price matching at Walmart but I just never bothered to read up on it because I thought it was more complicated. Specifically, I thought you had to show ads. I'm going to try it on my next shopping trip. Great question! Walmart will price match store-brand to store-brand. So great value will price match with Western Family, SurSavingsavings, and other store brands. However you are right, their policy is open to interpretation so it is a little different from store to store based on the management. You will notice that 90% of what I buy is store-brand! So where you have "my price" is that where you price matched? Yes, sorry! Should've clarified, I'll do so now. I am super jealous of your milk prices! I buy organic milk and its $6.50 a gallon here, but even regular milk is $4.73! Luckily my daughter is the only one who drinks it so we only go through a gallon every 2 weeks or so. I am definitely going to try price matching, clipping coupons is tedious and they rarely have coupons for what I want anyway. I wanted to comment on eating Gluten-free on a budget. The way I'm able to stick to to a budget on a GF diet is to go mainly GRAIN free and eat mostly proteins, fruits, veggies, and healthy fats. I do buy some GF whole grains in bulk and grind them myself. I found that the GF alternatives, in addition to being crazy expensive, are generally not very tasty or nutritious. It works fine for my family, if we have something for dinner like sandwiches or pasta, I'll use GF pasta for myself only or make whatever I'm serving into a salad. I do buy some GF pasta as well as tortillas and rice crackers. They are expensive, but since I'm the only one eating them it fits in my budget. Also, we have 5 people in our family, two of whom are teenagers, and I spend about $700 per month on food for my family. 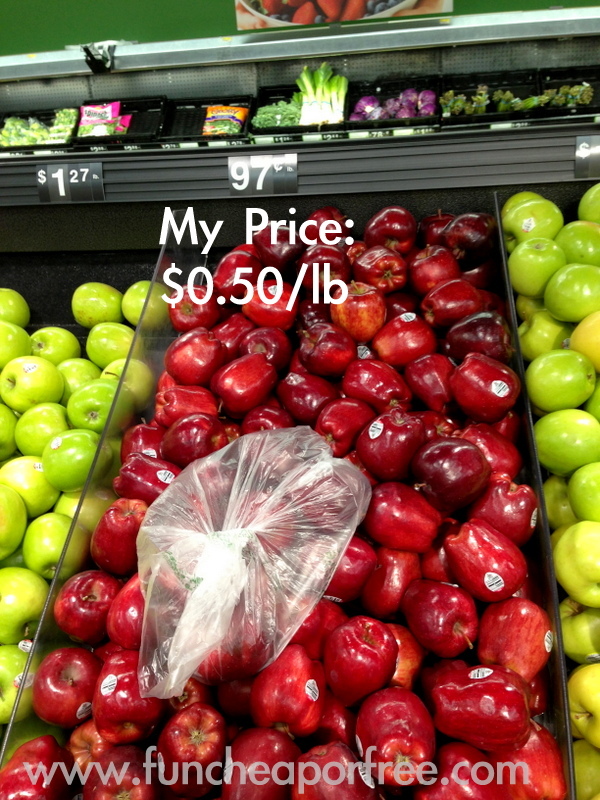 I price-match at Walmart as well as Costco shop. We live in a Washington DC suberb, so actually $700/month is pretty awesome :-). I love your blog! Your tips are great and I've been having a lot of fun putting them into action!! I tried price-matching at walmart after reading this last night and it actually went well! I have two questions… When things at other stores are B1G1 free, should walmart price it off of the other store's prices or their own? And my second question is do the prices have to be in another store's actual advertisement, or can they just be on sale there that week? Ok so let me see if I've understood correctly. As an example: I usually go to Pathmark and buy the Pathmark brand tuna (I think it's called America's Choice). So let's say America's Choice brand is cheaper this week when I go to Walmart. Could I (at least theoretically) price match the Pathmark brand with the Walmart brand? Either way they're store brands but I want to buy the Walmart brand because I'm already there. My gosh, I see the price of milk is INSANE everywhere. In Puerto Rico a gallon of regular milk is going for $6 now! Seriously, I'm beginning to really believe that it's cheaper to buy the cow! As per Walmart's policy you can only match prices from actual ads. So if a price is B1G1 free, as Long as its in an ad they will match the same deal! Thanks for sharing all the tips, and for reading!! Yes, as long as it is advertised as a special in their printed ad that week, Walmart will match it! If it's name-brand, it has to be the same brand/size/flavor or whatever. If it's store-brand, they will match it to their Great Value brand as long as it's the same size/flavor, etc. I so wish I could do this!!! I have tried several times and it is very stressful, I will find the best deals and plan my meals. Then when I get to the check out and start doing the price matching they always find a way to not give me the deal. They say for example they are no longer price matching the produce from Aldi, because its to cheap or the meat from brookshires. The rules are changing constantly and by the time I leave I am fed up with it all! Any tips or advice!